As you read this we are on our way to visit my family in Missouri. If it's after 9am central time, we are in Oklahoma. If it's after 5pm we are in the home stretch and the kids are driving me positively batty! ***ETA Due to Mother Nature's Winter Wrath we have not been able to head off for our Christmas visit. I have my fingers crossed that I will be able to leave this afternoon, stay half way and then do the rest of the trip tomorrow. I have another handmade gift to share could be used in several different ways, for numerous occasions. My brother-in-law is a newlywed. His bride expressed a desire to start entertaining now that they are married. She wanted to stock her bar and have a party. I got them a set of martini glasses to get their bar started. 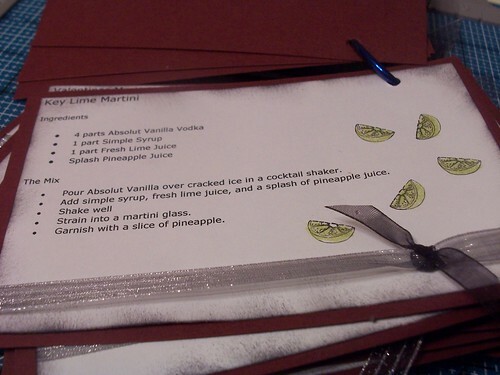 I also created a book of martini recipes. I put some standards, the 007, the appletini and some fun and funky drinks--wedding cake martini, milkyway martini. They're on a ring so that they could just pull one out and have a signature drink for the evening. I made sure some major holidays were covered (Ouija tini, Mayflower tini, Nutcracker martini) so they'd be set for any party need. This same gift idea could be used for a coffee lover (mugs and a ring of fancy coffee drinks) or bakers (ring of recipes and some neat baking utensils). Merry Christmas. We are off to visit family tomorrow. I have a couple of posts scheduled but I'm not nearly on the ball enough to have the entire time covered! Happy Christmas Eve. As a child I loved Christmas Eve as much as Christmas Day. We always went to Grandpa John's house and had all the yummy snack/appetizer type foods. His house is small and there were a lot of us but I loved it because I got to see everyone. I don't usually go back to visit my family until after Christmas Day now so we always miss the Christmas Eve festivities. I have 2 more quick and fun gifts to share with you today. The first idea actually came from Michael's. 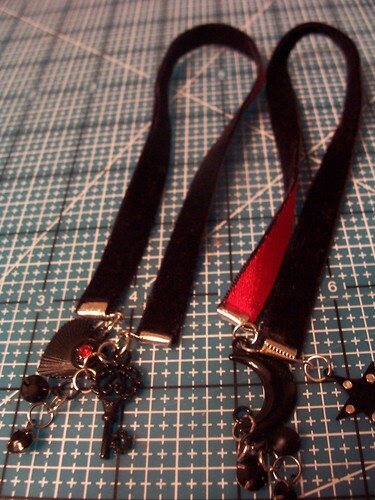 It's a ribbon book mark with charms on each end. I could not find the right kind of beads, you need a ribbon crimp with a hook in the center. I ordered some from Ebay but they were shipped to the wrong address. I did find some large crimp beads and that's what I ended up using for these. Basically you put a crimp on each end of a ribbon 8-10" long. Then you can use jump rings to hang charms, beads, gems, etc. off each end. The ribbon lays between the pages of the book and the charms dangle on each end. I must say there is quite a selection of gems and charms out there. I must stay out of those isles before I pick up another expensive habit..err...hobby! The second gift I have to share with you is an altered found item. 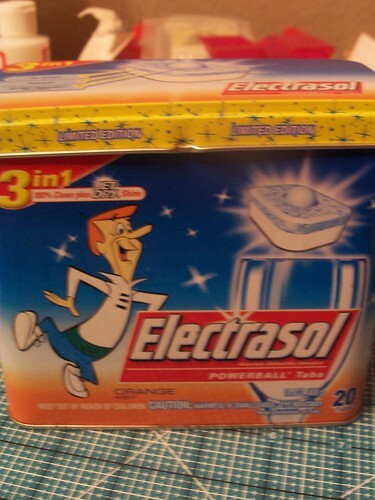 A couple years ago, Electrasol came in these Jetson's tins. They were the same price and the tin was neat so I kept all the tins in bin of trash to treasures. I turned the Jetson's tin into a dog treat tin with a little paper, adhesive and ribbon. The blue line that says limited edition was part of the original tin. It matched and I thought it was kind of neat to mark my work as a limited edition. 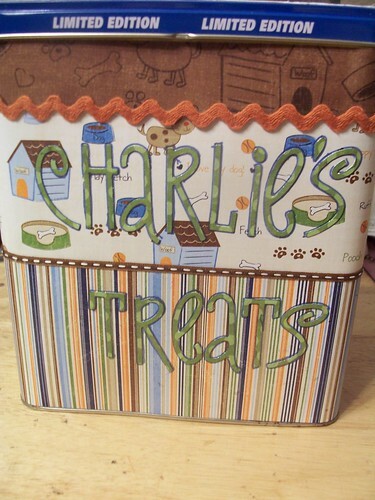 The treat tin is for my brother and his semi-new puppy. He is quite smitten and I'm sure will love having something to put Charlie's treats in. I am still plugging away at my list of things to finish making for Christmas gifts. Later today I have some food gifts to make but last night I was up until after one completing a few gifts. 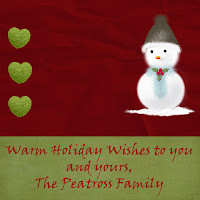 I have a couple quick and easy photo gifts to share with you. The first is a flip book from Snapfish. I normally would not order one of these books because they're a little pricey for what they are but I had a credit for a free one so I thought I would give it a try. 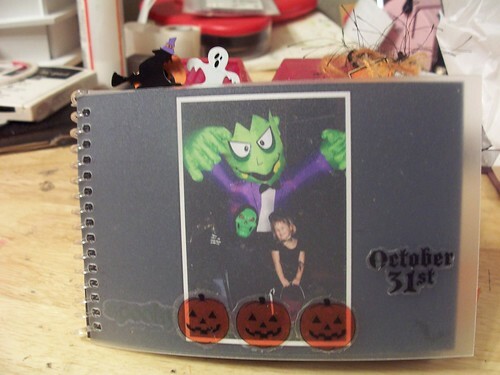 I filled the book with Halloween pictures to give to my mother-in-law. The book came with the photos on a mat and spiral bound with a cover. It was kind of plain so I pulled out some Halloween embellishments that I've been hoarding and "gussied" it up. 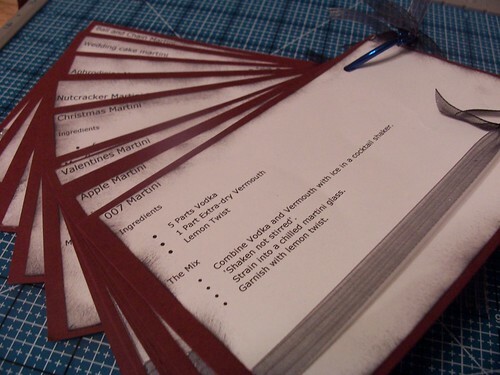 Now that I've altered the snapfish book, I think this would make a quick and easy bind-it-all project. The second gift I have to share with you was found in the dollar spot at Target. 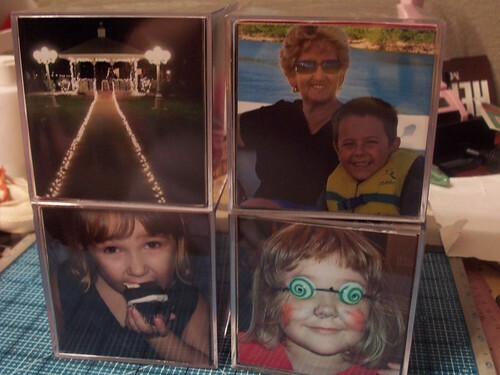 These photo cubes are going to be perfect stocking stuffers. 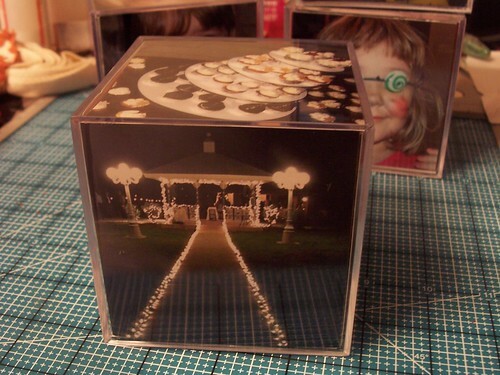 All of my photo cubes are going to men but for a lady I would add rub-ons, gems, flowers, ribbons, etc. to the sides after the photos were inserted. You could also put journaling in one of the spots instead of a picture. The possibilities are numerous all for $1. This year I have created a lot of handmade gifts. In fact, other than toys/clothes we purchased for Simon and Lizzy, all of our gifts are all or semi-handmade. Some close friends received boxes of cookies. I posted here about the digital calendars I made--six people on our list received the calendars. Since one of those calendar recipients was my dad, I didn't want to give my mom the same thing but I also wanted to craft something for her. I saw a perpetual calendar on a cookie sheet several years ago. I've wanted to create one (for myself!) ever since then but my mom is going to be the first recipient. I started with a cheap cookie sheet I found at Wal-Mart. Many websites have indicated that you should not get the non-stick sheets or the magnets won't stick. I tested the non-stick sheets at the store and the magnets stuck to it just the same as the non-coated cookie sheets. For my project, I selected the non-coated. They came in a set of 3 sizes for $3.79. I used the largest size for her calendar. I have plans for the other 2 in the future. The reason I chose the cookie sheet that was not coated is so I could utilize my Ranger alcohol inks to give it a distressed look. Of course I could have pulled an old cookie sheet out of the cabinet and achieved the same result but 1. I wouldn't get to use my very under-utilized alcohol inks and 2. I couldn't part with one of my well-loved, seasoned pans. The ink colors I used are Ginger, Latte and Cappuccino. I believe they came in a set. If you have never used alcohol inks, they're really fun and easy to use. 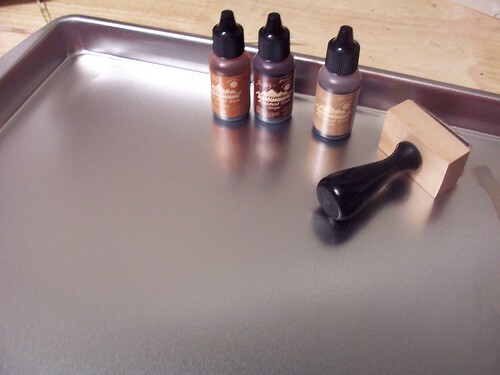 Ranger has an applicator that you place a piece of felt on and then add a couple drops of ink. The ink will stick to anything non-porous. The great thing is if it's too dark or you want to fix a mistake, there is a blending solution that will remove/lighten the ink. I tested my colors on the inside of the cookie sheet. I put all my elements on the backside of the cookie sheet. 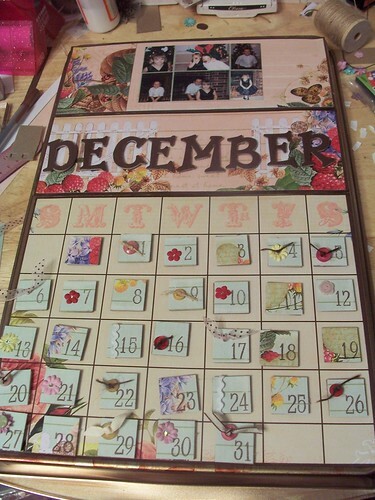 After distressing the cookie sheet, I added my blank calendar page, the section for the months and the section for pictures with decoupage. 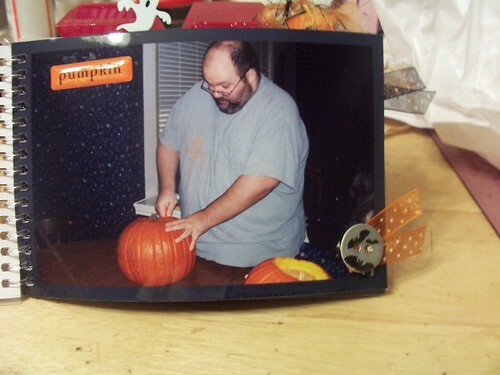 I found that it was easier to apply the decoupage to the cookie sheet and then place the paper. Otherwise, the paper absorbed a lot of the glue and the edges wouldn't lay down correctly. After the base of the calendar was created, I made all the elements. I cut 1x1 squares of chipboard and paper for each number. 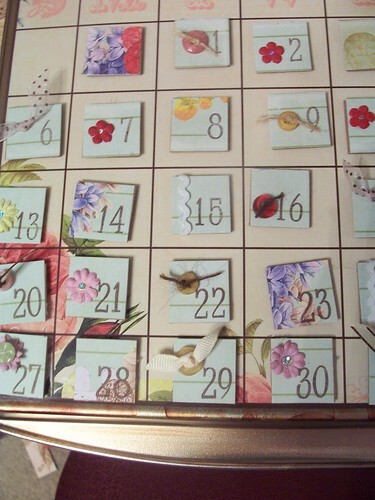 The numbers are stamped and then some of the squares are embellished with buttons, flower or ribbon. 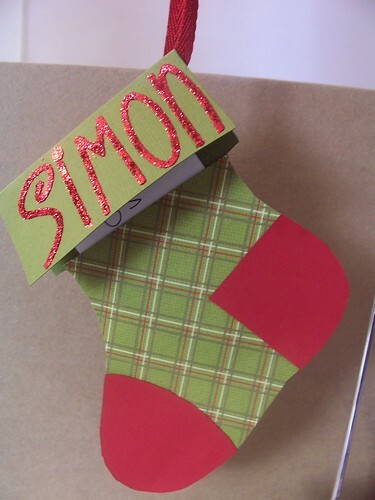 The letters for the months were created in the same manner but with my Sizzix machine. I cut the letters in chipboard and paper then glued them together. Each element has a piece of magnet on the back of it to make it stick to the cookie sheet. The magnets I used already have adhesive on them and come in strips. They are like $1 for a package and they go a really long way. The great thing is they are heavier than the magnets for business cards but still thin and really cheap. 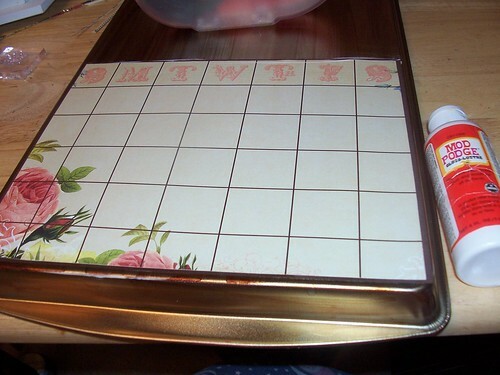 The calendar can hang on a nail under the cookie sheet or you could drill holes and hang it by a ribbon tied at the top. 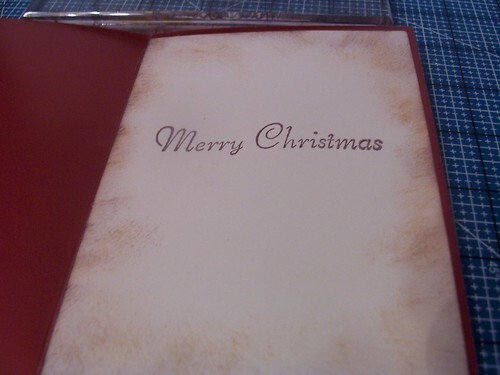 So I still haven't finished my Christmas cards. They are on the top of my list this week! I attended the crop at Felicia's Scrapbooks last night. It was the first time in her new location. Since everything was moved around, I of course found many things that I had not noticed or wanted before. One of those things were packets of 6 cards and envelopes by Kaiser Kraft. The cards and envelopes were shimmery and a great bargin at 1.99. I'm not sure I could buy paper and envelopes (especially colored envelopes) for $2. 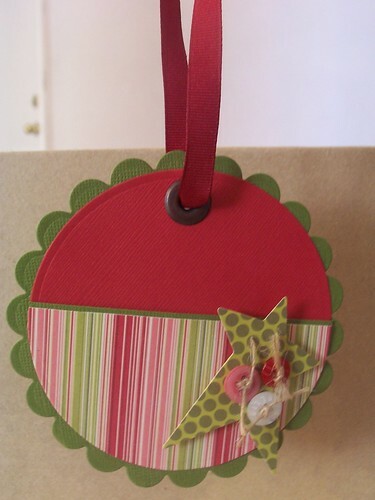 I received a prize from Paper Crafts Mag a few weeks ago when they had some blog candy for World Card Making Day. The prize package was the full line of Alpine Frost by SEI. 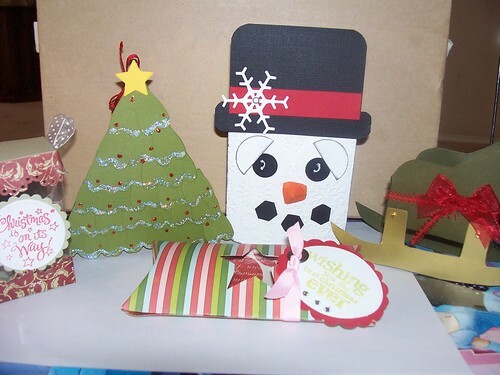 The papers are so beautiful and they came with a ton of embellishments to choose from. 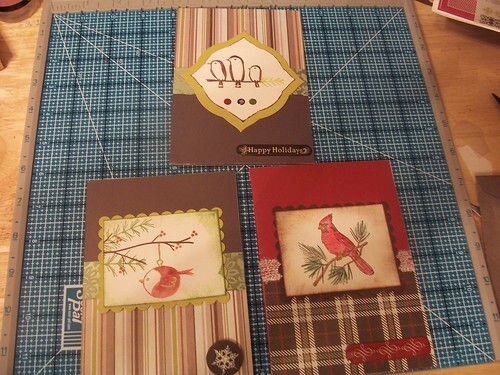 The colors were not colors I normally use for Christmas but they matched a couple of the Kaiser Kraft card sets mentioned above. This is what I created when I combined the two. The papers were just perfect so I didn't feel the need to embellish much. Once I got the basic sketch in mind they all came together rather quickly. 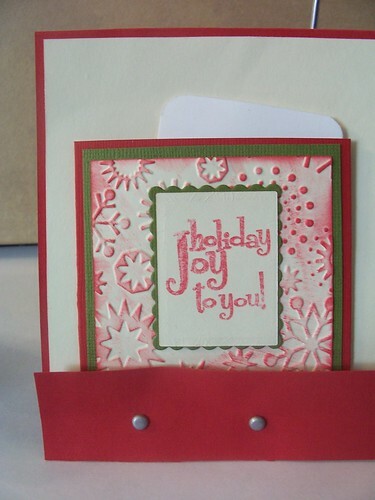 I also added a small scroll rub-on to each envelope flap. Now I only have 20 more cards to go! Patterned paper, rubons, accents and ribbons: SEI Alpine Frost. I am always looking for treat holders to put little gifts or candy in. This year I created five different treat holders. A couple of holders will be perfect for my holiday table and one or two will be great for stockings and gifts for people like school bus drivers and the librarian. The pillow box was made with a template from the cutting cafe. The other items were from various templates I found. 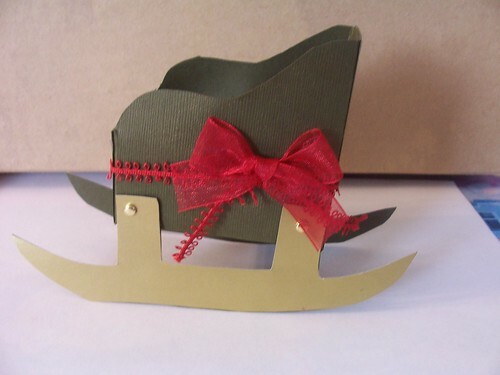 I've been busy creating gift card holders. I created five holders. Three of the holders have hangers so you can hide them in the Christmas tree, hang them over a co-worker's monitor, on a door knob or over a loved one's rear view mirror. The first three holders all have Scenic Route papers and pockets to hide a gift card in. 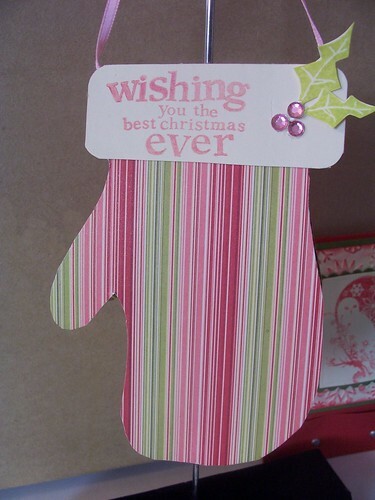 The stocking and the mitten both have a pocket inside to tuck the gift card into. I also created a matchbook style gift card holder. 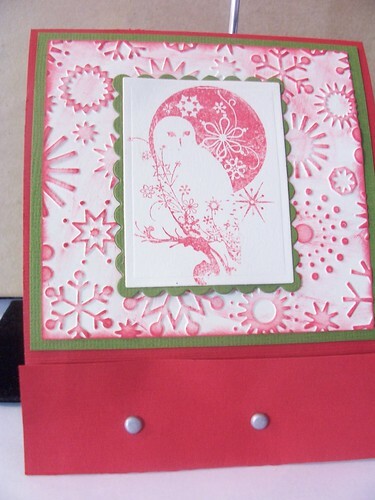 I used the snowflake embossing folder and a snowbird by Inkadinkado. 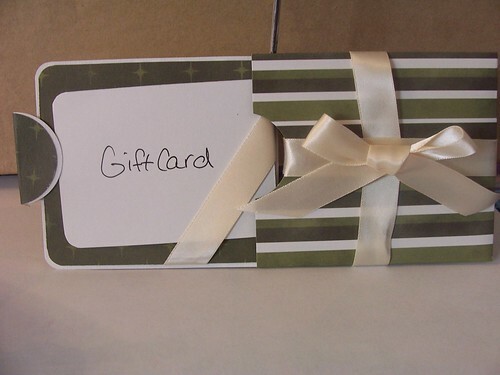 The last gift card holder looks like a wrapped present with a pull out that hides the gift card away. 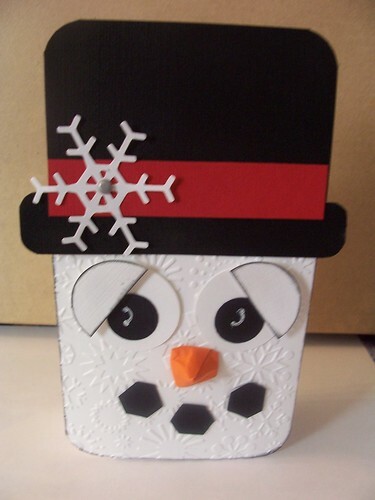 If you want to create your own gift card holders, I'll be at Felicia's Scrapbooks on Saturday the 12th. Class runs from 12-2. We have a new family member as of last night. My husband came home from work with Mocha. 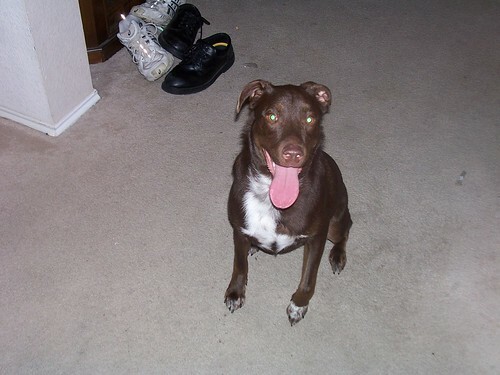 She is a chocolate lab/blue heeler mix and is very excited to have children to play with. Lizzy is head over heels smitten with her. I expect she and Mocha will be having teas and dress up dates soon.